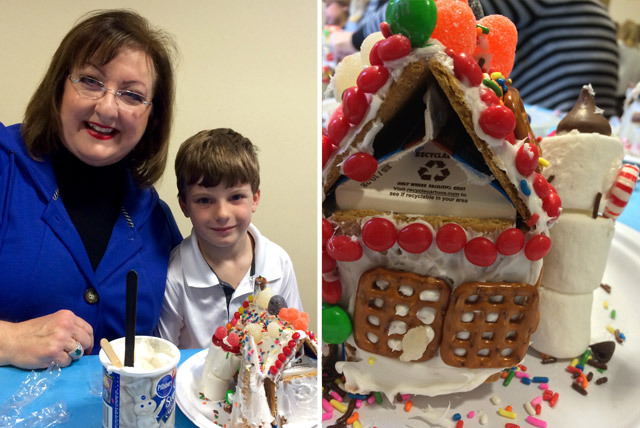 My precious grandson, Hays, invited me to be his guest for the gingerbread house day at his school. I was so excited and couldn’t wait to see 20 kids decorate their little houses. Each child got to invite one parent or grandparent, and I was the lucky one in our family, so it was off to school for GiGi. I thought the idea was fabulous. The little houses were already assembled when we arrived. Two small lunchroom-size milk cartons had been glued together using a hot glue gun. You can see from the photo above, the eaves of the house is the folded top of the cartons. Then the cartons were covered with graham crackers. One large plank covered each side and each roof side. The ends were covered with a half of the large cracker. 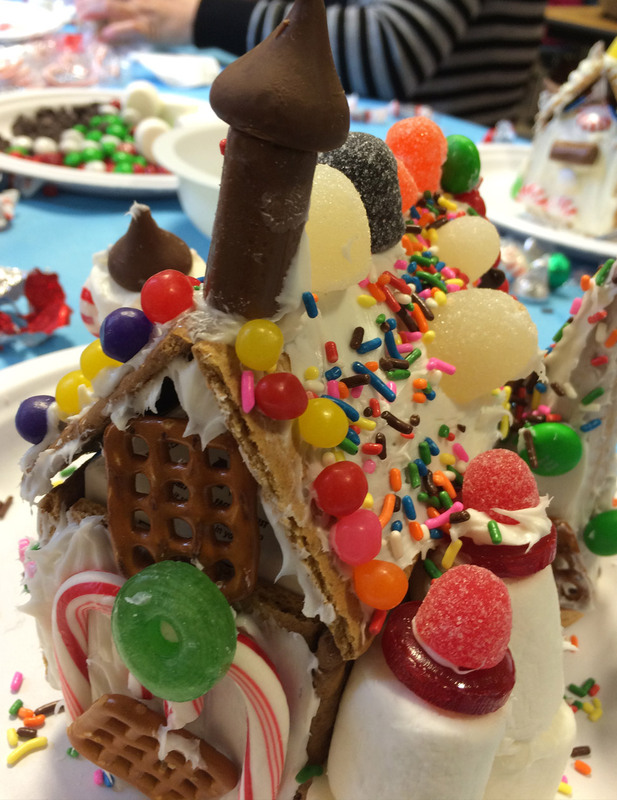 The graham crackers were attached with glue and allowed to dry completely before this decorating began. Hays and I had our own can of icing, and there were all kinds of candies, cereals, pretzels, and candy canes to choose from for our decorating plan. We turned ice cream cones into wintry trees, and he giggled as our marshmallow snowman kept falling off the paper plate. And who could even think that a reindeer could be made from marshmallows and candy canes? That’s boys for you. 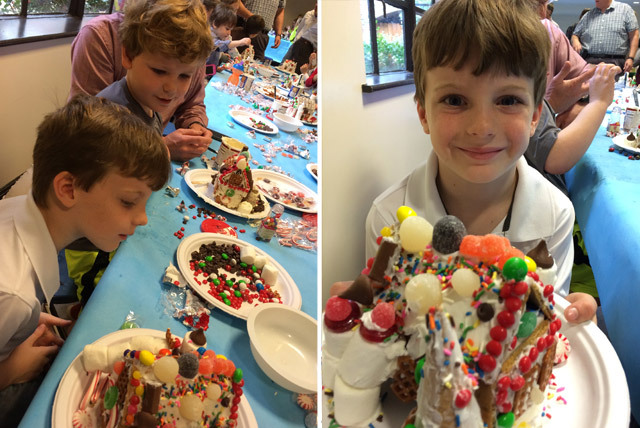 The boys were quite zealous in their decorating, while the girls meticulously planned their little masterpieces. This is a wonderful project for children. If you have grandchildren at your home for the holidays, this is great fun. You will be surprised at their creativity and yours. 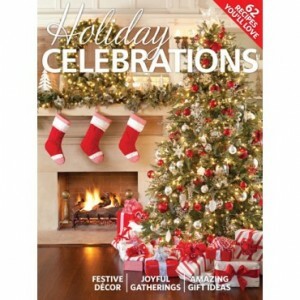 Have a favorite holiday project for kids? I’d love to hear about it in the comments! Your post made me smile and brought a happy tear to my eye. I remember doing this with my son (who is now 15). We had such a great time doing this at his school. The children loved it and I think the adults loved it even more. These are the things that make such wonderful memories. And a perfect gingerbread house it is. We took our 3 year old grandson to Polar Express this weekend and my favorite part was watching his reaction…love seeing Christmas through children’s eyes…Happy Monday, Phyllis! We did Gingerbread houses this year with our 4yr old and 2 yr.old grandchildren..Really Aunt Lori did it with them!! They all had soooooo much fun. You are so right, girls make them so different than the boy…This will become a Thanksgiving tradition at our house..
What a great idea, looks like a lot of fun for all ages! Thanks for sharing! Such fun you 2 had! He is such a cutie! Just looking at both of you made me smile. I have a 6 yr. old grandson and for sure we’ll try it.. I have never made a gingerbread house, so can only imagine what fun it will be. Thanks for sharing. Darling boy and you like a kid yourself with that big smile. Yes, creating Gingerbread Houses is a fantastic project which I also Did with my classes each year as an Early Childhood teacher! I never thought to invite a family member to help, which would have been exciting! Thanks for sharing this with us. My favorite paper craft for Christmas was to create Rudolf the Red nosed Reindeer. Trace one of the child’s shoes on dark brown construction paper. Trace each hand on black construction paper. Cut out the tracings. At the narrow end of the shoe tracing, the child’s thumbprint (made with non-toxic stamp red paint) becomes Rudolph’s nose. Have the child draw a smile with dark brown crayon. For the reindeer eyes, use either two fingerprints, craft google eyes or have the child draw the eyes with crayons. The cut out handprints becomes the antlers. If done as a tradition each year, you would have a family of reindeer as time goes by. Or have the whole family make this craft together. Blessings to you and your family at this holiday season. I guess I’m the newbie here! I just bought a kit to make with my granddaughter. She just turned five and this will be a new experience for both of us! It should be a lot of fun! It is also our tradition before Christmas to make a gingerbread house! It began when our grandson was two (he’s now 12)…. Our second grandson soon joined the team (he’s now 11) and then our first granddaughter (now 9) and the baby girl…. (now 7). We laugh….. Decorate…. Laugh….eat some of the candy….and laugh some more!! Then, we take pictures and admire our marvelous creation…exclaiming each year…the best!! We LOVE our time together and it makes this time of the year even MORE magical!! I also make gingerbread houses with my grandchildren. One year they wanted to make a manger, another year a barn, so it is great fun. Another thing we do almost every year is make ornaments. I buy the plastic balls that can be filled with fake snow, tiny little trinkets for small trees, candy, Christmas confetti, pieces of yarn, shredded gift wrap, etc. Then we decorate the outside with snowflake stickers, stick on gems, rub-on stickers, etc. Then choose your ribbon to put through the top and hang on the tree or wherever you want. Fun! Do it every year with the grandchildren and Jim. So much fun! My granddaughter Madison and I began a tradition of crafting Christmas presents for her immediate family when she was five. I wanted her to learn the pleasure of giving as well as how much fun it is to give something you made yourself. We had fun finding a new project and then figuring which person gets which creation. She is twelve now and we love our Gramma days.